I unloaded the kiln bright and early this morning to see what wonderful surprised might have occurred during this firing. While glazing each piece I have a mental picture of how it will turn out. Each time you open the kiln you discover things that turned out how you expected and things that didn’t. Sometimes the ones that didn’t turn out become really good examples of what not to do again. But my favorite are the ones that didn’t turn out as expected, but are so much better. The platter shown here, which measures 16″ across, turned out better than expected, but still not really good. 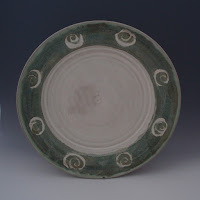 The blue/green glaze on the rim ran into the spiral pattern more than I had hoped. Something for me to work on next time I guess. Thanks for reading.